What is marketing and digital media? Marketing is responsible for customer relationships and communicating with customers. Marketing involves researching customer needs, communicating customer insight into new products and services, and promoting, branding and advertising the organisation to its customers and wider public. Marketing’s interaction with a business’ customers and public has shifted into the digital media space where business communicate directly to customers using, for example, mobile phones, websites, social media, email. Marketing and digital media encompasses all platforms that connect organisations to customers and, in turn, translate customer information via marketing analytics into new knowledge for the business to help it further meet customers’ needs. What is the BA (Hons) in Marketing & Digital Media? The BA (Hons) in Marketing & Digital Media is a four year degree course, which prepares students for employment in marketing in the digital age. The first two semesters consist of general marketing and business subjects and then students study the specific marketing, advertising & media subjects from semesters 3-8. Team ‘Media Edge’, comprising of four third year students from the Marketing programme at WIT, has been announced as the overall winners of the live-project corporate competition supported by Enterprise Rent-A-Car. 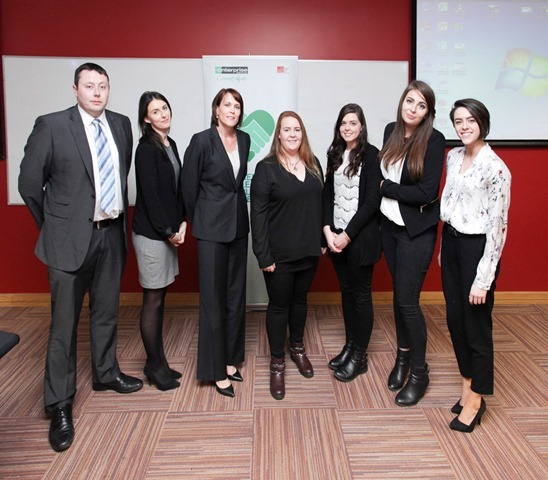 Enterprise Rent-A-Car partnered with students from the class from WIT where teams of students were provided with a real-life marketing brief as part of their advertising strategy module. Enterprise began working with students as part of a mentoring programme in January, when the teams were asked to devise an advertising strategy to include a video element to promote leisure car rental in the South East area. Photo details(left to right): Steven Coyle, Vehicle Acquisitions Manager, Jennifer Minogue, HR Generalist and Talent Acquisition Specialist, Leslee O' Loughlin, HR Manager Enterprise Rent-a-Car photographed with members of the winning team Media Edge, Neasa O' Brien, Eibhlin O' Keeffe, Hazel McPartlan and Jenna Eustace. The work placement or study abroad takes place in Semester 7. It allows students to gain real experience of working in a marketing environment. Companies who have been involved in the placements include: Coca Cola, Aer Lingus, Ben Sherman, Bulmers (C+C), Bank of Ireland and Advertising Agencies such as Rothco, Cawley Nea and Youngs. Students can also opt to study abroad in one of WIT’s partner institutions in Europe, Canada or the USA.